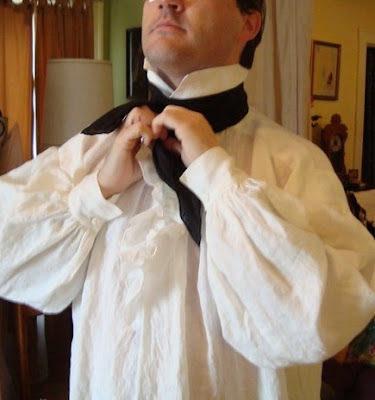 On Saturday I stopped in to the Bells Mill Clothier, at the request of the proprietress, Mrs. Graham, for a fitting. I put on my new shirt, which was lovely and fit perfectly. I did not, however, take it with me when I left, as she offered to stitch my initials onto it. I was also able to see the other parts of my new suit whilst in construction. The wool coat, which still lacked buttons, finished cuffs and a few other things. I put it on and she marked it up as she saw fit with pins and chalk. Then I tried on the simple cloth mock-ups of my waistcoat and breeches, to which she gave the same treatment with the chalk and pins. Her good husband's new hat was nearby, and it afforded me the opportunity to try it on. I do so hate to buy a hat, sight unseen. It was a fine tall black hat. Making a slight adjustment to my knot.